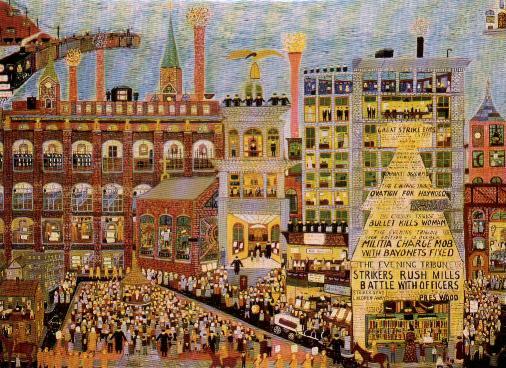 On this day, Labor Day, I am showing a a painting from the great American folk primitive painter Ralph Fasanella, depicting the famed Bread and Roses strike that took place at the textile plants in Lawrence, Massachusetts in 1912. I thought it fitting that something be shown that is closer to the spirit of this holiday which has faded from the public’s knowledge in recent years. I was a union member in my first job at a Loblaw’s grocery store when I was sixteen years old and a few years later I was a Teamster at the A&P factory where I was employed for several years. I was the union steward in my department for the last few years, a position that I took because nobody else wanted the hassle of it and meant that I was protected from being laid off so long as my department was operating. The hassle came from the fact that there was always an argument to be had, either with company supervisors who tried to twist the rules to their advantage or with co-workers who felt the union didn’t go far enough. It was a very educational experience. The image of labor unions over the years has crumbled, perceived now as corrupt and self-serving. Probably a well deserved image. But the failings of these unions are the failings of men, the same failings that the company owners possessed that the early unions organized against. Greed and a lack of empathy for their workers. It doesn’t take much research to discover that the work conditions of the last 130 or 140 years were deplorable. Long hours. Low pay. Incredibly unsafe conditions. Dismissal for any reason. No rights whatsoever. Today, many view industry as this amiable, father-like figure but don’t realize how much blood was spilled by early union organizers and members to obtain the things we now take for granted as our rights. Industry did not willingly give up anything to the worker without being forced. I can imagine what our world would look like without the efforts of our unions. This very holiday would not exist to have it’s roots forgotten. The idea of vacations would only exist for the company owners. The pay scale would be similar to those places on the Earth where many of our jobs have migrated, places that allow the avarice of the companies to override the rights and safety of the workers. Places where sweatshops still operate, as they once did here. Places where unschooled children toil in dirty, dank conditions, as they once did here. Places where the health and safety of the workers is secondary to the profit they provide, as it once was here. I will be posting more on Ralph Fasanella in a later post but for more info, check out this book from my friend Paul D’Ambrosio, who is perhaps the foremost authority on Fasanella and his work, Ralph Fasanella’s America.